Mercedes-Benz: A name that at one time symbolised a continuum stretching back to the dawn of motoring and an ethos that embodied the sternest, most rigourous engineering ideals with a relentless Swabian logic. By 1957, the Mercedes-Benz 300SL was the most modern, most eloquent exponent of these principles and perhaps the most technically accomplished car in production – this side of a Citroën’s homegrown goddess anyway. The W198 300 SL was introduced in 1952, initially as a competition model. Taking the Daimler-Benz 2996 cc in-line six cylinder engine from the 300 D-series saloons, the much modified power unit featured an alloy cylinder head with a single overhead camshaft and fed by a sophisticated Bosch mechanical multi-point fuel injection system. The engine was canted at a 40° angle to reduce bonnet height and mounted well back in the chassis for improved weight distribution. Developing 215 bhp at 5700 rpm (a 240 bhp-rated motor was also available) this superb engine powered the 300 SL to hitherto unheard of velocities. Designed to be subject to push-pull stresses but not torsional motions, the purpose built and rigid aluminium spaceframe provided a racing-car specification for the road. Front suspension was by double wishbones, coil springs and an anti-roll bar, while at the rear, swing axles, coil springs and a transverse compensator spring rounded out this typically Germanic set up. A four speed transmission of Mercedes’ own design sent power through a ZF limited slip differential. Less advanced however was the car’s all-round (massively finned) drum brakes and recirculating ball steering. It was the car’s spaceframe chassis and its multitude of lateral bracing tubes which precluded the fitment of conventional doors, leading to the roof-hinged gullwing articles which defined the earlier 1954-57 production cars. 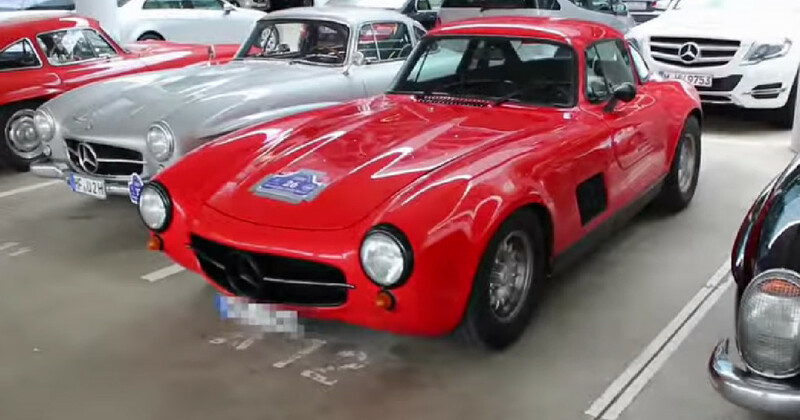 A regular fixture on the starting line-ups from Le Mans to the Mille Miglia, the Friedrich Geiger-designed gullwing SL, by the end of its production run was already a race-winner and arguably the very first supercar. Certainly, there was no faster, technologically advanced, (nor better built) performance two-seater at the time. Following requests from Mercedes’ American distributor, Max Hoffmann, for a more civilised open version, Mercedes announced the 300SL roadster only a matter of months before Russia launched her own grasp towards the stars with the Sputnik satellite programme. Changes to the 300 SL’s alloy spaceframe were considerable to allow for decently sized apertures and conventional doors. Further technical changes were confined to the fitment of low-pivot swing axles to help tame its wayward lift-off handling characteristics, a smaller fuel tank (the original’s massive one only aided weight transfer when full) and in 1961, the belated fitment of all-round disc brakes – a vital safety feature hitherto missing on such a powerful machine – and a rare example of Daimler-Benz engineers being behind the technological curve. Visually, Geiger’s changes above the waistline were obvious. The coupe’s streamlined roof was shorn, but the car’s muscular stance, teardrop shaped fairings over each wheelarch and for the period, modish pontoon-wing silhouette was retained. At the nose however, one major change took place. The fitment of teardrop-shaped integrated headlamp pods (not fitted to US market cars) would not only act as an obvious recognition point, and modernise the car’s ‘face’, but would come to define an entire generation of subsequent Mercedes-Benz designs. While the 300 SL Roadster presented a less treacherous handling proposition to the unversed; the breakaway characteristics of the low-pivot swing axles being less abrupt than that of the gullwing, nevertheless, it remained a car that rewarded the seasoned, more physical driver. Despite the extensive use of alloy, it was a heavy machine, both in its overall bulk and in its control weightings. The gearbox in particular being oft-criticised for recalcitrance. But none of this detracted from the 300 SL’s superiority, its otherworldly thoroughness, making contemporaries (including BMW’s lauded 507) appear as blunt appendages by comparison. Never a cheap car, either to build or to purchase, the SL appealed to well heeled socialites, the racing fraternity and naturally to the showbiz set. Clark Gable, Sophia Loren, Gina Lollobrigida, Tony Curtis, Pablo Picasso and British comedian, Tony Hancock were amongst notable 300SL owners. Racing drivers, Juan Manuel Fangio and John Surtees also owned examples. The numbers built were miniscule. With around 1,400 gullwings and 1,858 roadsters built at Sindelfingen until February 1963 when the model was phased out, it’s doubtful Mercedes-Benz made as much as a Deutschemark on the entire programme. But that wasn’t strictly the point. Its indirect replacement, the 1963 (W113) 230 SL Pagoda was a very different machine and took the Sports Leicht in a vastly different and considerably more lucrative direction. Because the 300 SL in both open and closed form, did so much to cement Mercedes-Benz’s technological and performance car credentials, Stuttgart-Untertürkheim didn’t see the need to make anything similar for generations. The 300 SL was quite literally the very best Mercedes-Benz engineers and designers could achieve; a vehicle that was as much aircraft as motor car. Latterday adherents to the Dr. Zetsche doctrine will point to today’s slow-selling AMG GT as the 300SL’s spiritual successor, but the AMG is just another vast, overblown, steroidal caricature. All sound, fury and puffed-up vainglory, signifying nothing. Mercedes-Benz have come a long way in sixty years. Quality writing covering a quality car. Beautiful too, in a strong manner, so ‘Leicht’ seems to me to be the only deception of this car of substance. Oh, and the current GT? Couldn’t hold a candle to this. Thanks for this article, I enjoyed reading it very much! Seeing the last two paragraphs, I immediately thought of the Mercedes 600 which in a way could be seen as the spiritual successor of this car: demonstrating the top of technology and build quality that was achievable at the time, only now in a completely different segment. Mercedes-Benz truly were in a league of their own, which makes their fall from grace so particularly painful. This excellent piece of a not quite overlooked, but arguable underappreciated masterpiece underlines this point. Every car-mad schoolboy was well aware of the Gullwing — and its later development, the sports-racing 300SLR (not for public sale) and Moss and Jenkinson’s Mille Miglia (or was it Targa Florio?) drive in one, described in detail in Motor Sport. As it happened, a schoolfriend’s (slightly dodgy) dad had a 300SL, so we were able to give it a good look. Said dad returned it, complaining not of its terrifying handling but that it wouldn’t reach its claimed 160mph! I know someone who owns a red roadster. It is stunning. The W198 is a very German car – fundamentally flawed but honed to perfection. Just like a Beetle or a 911. When new, it sold for about the same money as a Lancia Aurelia GT. Given the choice, I’d have taken the Lancia any day. When I was a child one of our neighbours had a gunmetal grey SL coupé. I remember him accelerating towards me at very high speed with an incredible sound and complete disrespect for the relatively new inner city speed limit. I had to jump off my kick scooter to avoid being hit by his car.